HRsuccessmantra: What can you do to get the best out of your Boss? Invariably, when people think of managing someone at work they think of it as a one way street. They think of their bosses managing them. Yet, in my experience, I've found that bosses can also be helped to help you. They need to be helped by their people because they often over or under manage them. For example, they over-manage by micromanaging and continually checking on a project's status. They under-manage by not giving their people enough direction, detail or feedback. These kinds of problems occur for a number of reasons. 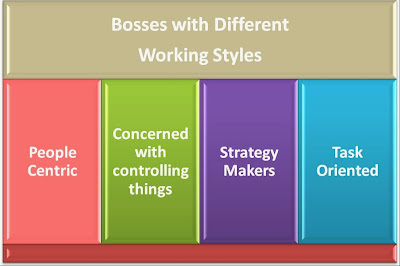 At the start of middle management, Team Leaders are often promoted for their operating excellence and are made incharge of career of at least 6-7 people, however, are not trained enough on people skills.They keep doing what made them successful so far - individual excellence and mess up with the career of their sub-ordinates. Many times, they also don't have any good role models for what a manager should do. And they rarely get feedback as to how they're doing. So, if you have a boss who over or under manages you, what can you do to get the best out of your Boss? Whenever you see a gap in the wavelength between you and your boss you need to identify what are the attributes which make you different from him. A successful boss-subordinate relationship is when you start complementing the differences and take charge wherever required to make your boss look good. AMBITIOUS – They are interested in looking good and getting ahead. Show them how supporting you are and how your projects will be viewed favorably by Top Management and thus support his ambitions. LONER - They like to work alone. Loner bosses do not like to supervise others. Praise their pet projects and offer to help them with some of the administrative work. Keep them informed on what is going on with the team. POWER HUNGRY - They like to control and show they are in control. Keep them informed. Give them a chance to “influence” your decisions but do not give in and become timid. WIMP BOSSES - They are indecisive and will not make waves even for progress. You have to push them to make decisions. They love to hide behind bureaucracy. You can help by agreeing to take some of the heat or giving assurance that nothing bad will happen. BUREAUCRATIC BOSSES - They like rules and policies and the status quo. You must show that you are following the rules, organizing things in a logical way, putting things in writing and giving them time to think it over. FIRE FIGHTER BOSSES - They like to fix problems. They thrive on finding disasters and solving them. You must show a sense of urgency, give them frequent updates and find the next disaster to keep them busy. UNETHICAL BOSSES - They have no shame. They can be of any of the stated categories and make a deadly combination. You must document everything. Make sure you meet your objectives and stay true to your values. You can call them out but make sure you have a back-up plan. Of course, in helping your boss you should know his personal inclination, as well as your personal bias. If you are process oriented, you will tend to present issues in a systematic and orderly fashion, with pros and cons, chronology of tasks, etc. If your boss is the action type, he could be bored. In that case an executive summary, emphasizing the key actions and results would be a handy starting point. You need to be cognizant of the working style of your boss so that you can match up to his expectations. Bosses who like to 'control things' normally introduce processes, develop more the 'now' attitude. Bosses who are more concerned with people, develop more impact on people. Bosses who are more concerned with getting things done, start with key actions and bosses who are more concerned with ideas, frame proposals in concepts. Remember your purpose - Don't let your boss sidetrack you from your goals and purpose. Focus on what needs to get accomplished and use the rest of these tips to get your boss' support. 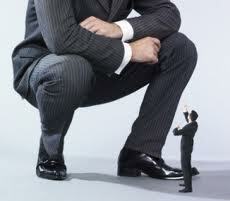 Understand your boss' problems - Ask your boss what kind of pressures he is under. Now you may not think it's your place to do that, but it can make a great difference in your understanding why your boss is not managing you properly. Compliment what is working - Give your boss positive feedback on what is working in your relationship. For example, say "Thanks for your valuable feedback," when he gives you a useful response. Be a role model - If you want your boss to do certain things, do them yourself. For example, if he or she doesn't listen well, practice active listening in your interactions. He or she will probably match your positive behavior. Let him be wrong - Try to correct him few times and if it doesn't work, let it go. You won't always be able to save him. Certain things which you need to do no matter what kind of boss you have is, don’t compromise on performance, keep your boss abreast of what you are doing in the way he wants himself to be updated, abide by your commitments, under commit and over deliver, be cognizant of your threshold. To reinforce trust make sure that your boss is not surprised by others rather you should be the first one to tell him if something doesn’t work well. Never criticize your boss in front of others rather discuss with him directly so that you can also help him grow. Remember that your success lies in your bosses’ success so contribute to make him successful. Follow Me on LinkedIn to see more such posts and this is a good post. All the readers will try to explain this idea with others and some topessaywriting reviews new ideas. I want to tell the people about the idea of such types of blogs.